Hold on to your butts, because we’re about to tell you about the cutest, most fun comic since “Welcome to Showside.” It’s called “The Backstagers”, and it’s a laugh out loud funny story about the misfit stage crew at St. Genesius High School. 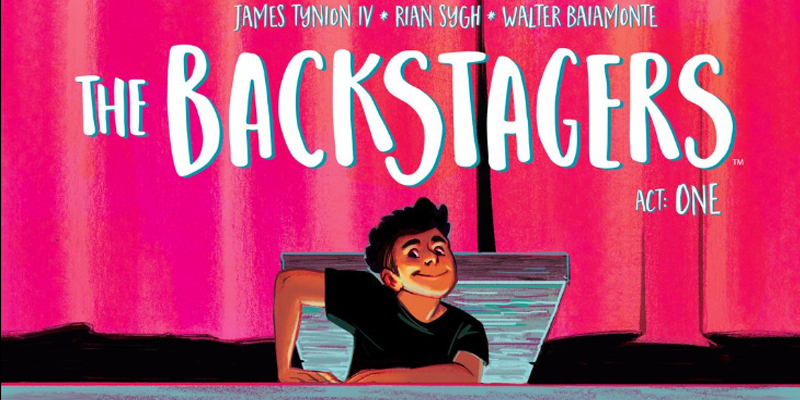 “The Backstagers” is the newest series from Boom Box and is written by James Tynion IV and illustrated by Rian Sygh who bring us a story that’s been severely lacking in the comic world – a tale of drama club, theater puns, magical portals to other worlds, and a ton of LOLs. 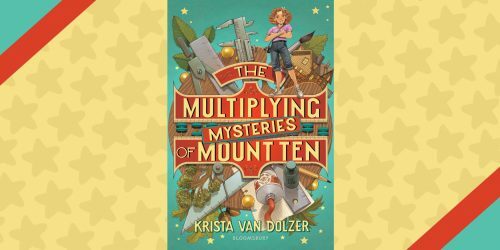 The book is being described as “Lumberjanes for boys”, which we can see – it’s definitely got a similar spirit, but it honestly stands out so much on it’s own. (It’s not just for boys, either! We’re girls who love it, so ladies, don’t be afraid to fall in love with this series!) We were basically all ? the entire time we read it – and that’s just Issue #1! “The Backstagers” follows Jory, a new student at St. Genesius High School, an all-boys prep school. Jory is kind of shy and anxious, making tackling a new school even harder than it would be for most. He’s just trying to make it through the day when his mom encourages him to join an after school club since she recently transferred to a new job that will keep her working late most days. Jory isn’t exactly excited to embrace even more change, but decides to try heading to a drama club meeting to see what it’s all about. When he gets there, these two over-the-top-get-all-the-lead-roles-and-rule-the-school-types (Think Sharpay and Ryan Evans from “High School Musical”, but even more intense), Kevin and Blake McQueen, don’t think Jory’s got enough passion for the stage, so he gets sent to the prop room to try and find a tiara they need for an upcoming scene in the play they are rehearsing. That’s when Jory finds himself smack in the middle of a Tool Mice attack and meets the eccentric stage crew. They don’t just fetch props and build sets, nope, beyond the prop room beneath the school are magical hallways and tunnels that often change places (think the Grand Staircase in “Harry Potter”, but cooler) and open to another world, sending the boys on all sorts of out of this world adventures they never expected. 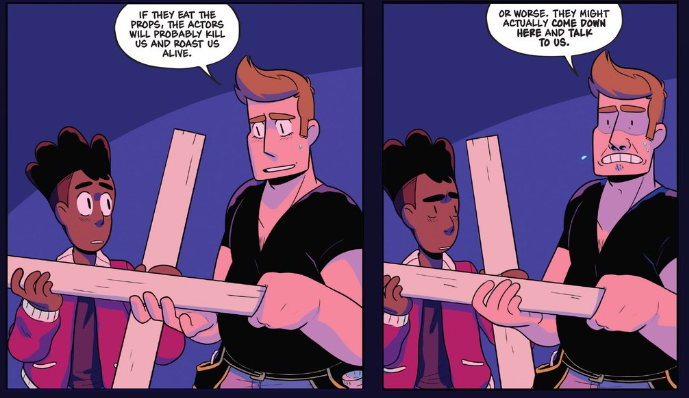 At first Jory is scared and confused, but after helping Hunter, Beckett, Sasha, and Aziz take down the Tool Rats, he realizes he may have just found his people and and his place at St. Genesius. We can’t wait to see what weirdness, danger, and adventure lurks behind the curtain in the next issue! Even though Issue #1 gives us just an introduction and a short glimpse into what we can expect from this adorable 8-issue series, we fell in love pretty much instantly. 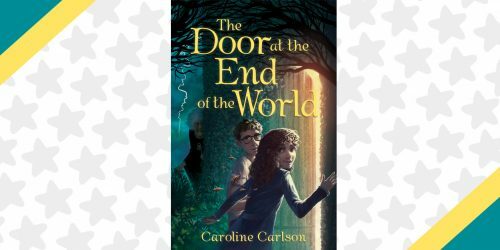 The characters are so quirky and loveable, the story is full of so much heart, and we just couldn’t get enough. 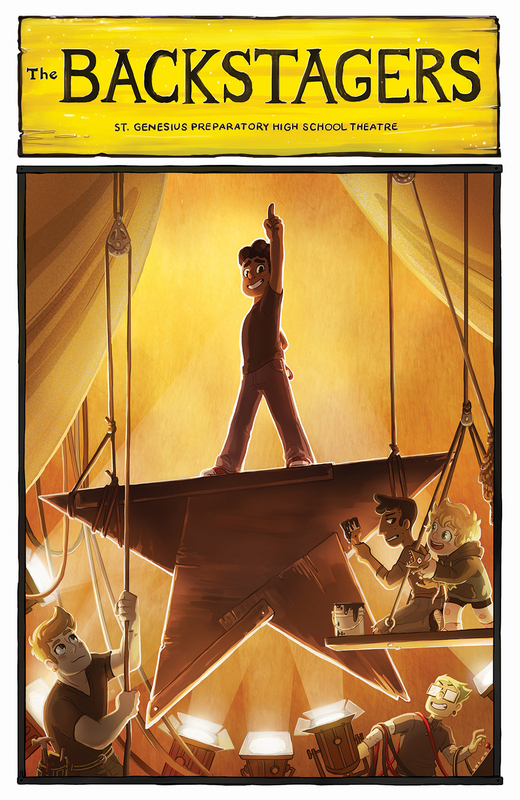 Also, did we mention one of the incentive covers is a completely precious homage to “Hamilton”? Yeah. These guys know whats up. 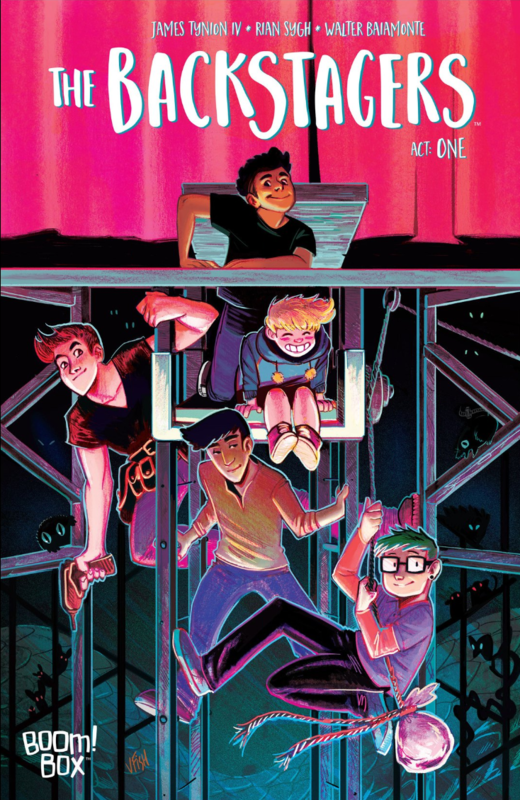 “The Backstagers” is definitely a comic you guys need to go out and support and buy up issue by issue so we can see it get picked up for a full run! 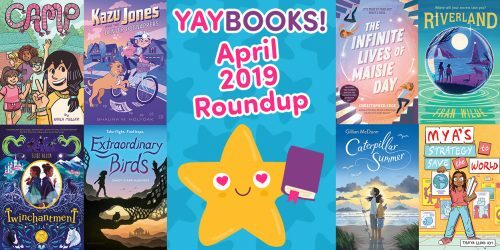 For even more comic recommendations, click here!